Do you have any friends who don’t like sweets? It seems to me that all the people I know don’t like chocolate or sweets. What’s a girl obsessed with sugar supposed to do?! Its downright difficult pawning off my baked goods. That’s why I get so excited when friends’ birthdays roll around. I pretty much know they’re going to indulge in at least one piece of a homemade birthday cake. It used to be that most of the cakes I made were liberally frosted. Not because I was a huge fan of frosting, but because I love the way frosted cakes look. It’s the best when you cut into a frosted cake and all the layers underneath are revealed. Unfortunately for me, no one I know (aside from my four year old nephew) actually likes frosting so I’ve taken to making naked cakes. I feel like naked cakes don’t have that wow appeal when you cut into them, but they sure do get eaten a bit more quickly. Instead of having frosting in between the layers I’ll do whipped cream with fresh fruit, jam or a fruit curd. Raspberries and lemon taste just like summer so I baked them into a cake for my friend Bruce, whose birthday is right before the first day of summer. Sweet, tart and fresh tasting, this cake is the perfect for summer time treat. 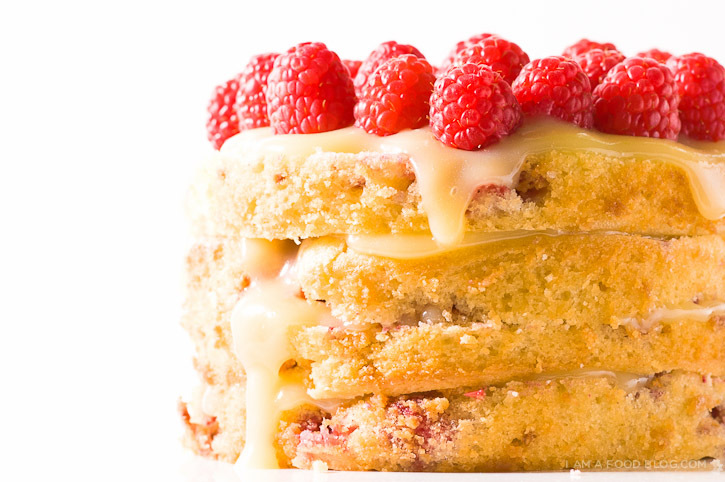 The sour cream makes this cake super moist and the random raspberries throughout make each bite a delight. 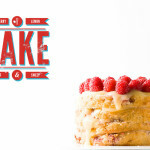 i am sweet, i am tart: i am raspberry lemon cake! Preheat the oven to 350°F. Prepare 2 4 inch round cake pans with parchment paper. Sift dry ingredients into medium bowl. Transfer 1 tablespoon flour mixture to larger bowl. Add fresh raspberries and toss to coat them with flour. Set remaining flour mixture and raspberries aside. Stir milk, sour cream, vanilla extract, and lemon zest in small bowl. In the bowl of a stand mixer, cream butter and sugar, until pale yellow and very fluffy, about 5 minutes. Beat in eggs one at a time, until well combined. Mix in flour mixture alternately with milk mixture, starting and ending with flour mixture. Stir until just combined. Gently fold in the raspberries. Divide batter equally among the pans. Bake cakes until toothpick inserted into centre comes out clean, about 35 minutes. Cool cakes in pans on racks for about 10 minutes, then invert onto racks until completely cool. Whisk together the zest, lemon juice, sugar and eggs in a heavy saucepan. Add butter all at once and cook over moderately low heat, whisking constantly, until curd is thick enough to hold marks of the whisk and bubbles appear on the surface. Immediately pour curd through a fine sieve and chill. To assemble the cake: trim any doming with a very sharp knife. Split each cake into two by making one even horizontal cut. Put a bit of lemon curd on the plate or cake stand your cake is going on. Put 1 layer on (cut side up) and spread the top with 1/4 of the lemon curd. Repeat with the remaining layers. Top the top layer with raspberries. 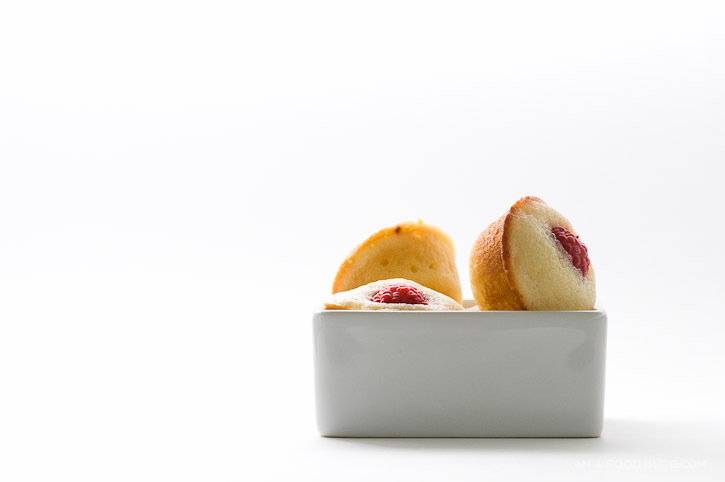 **These work equally as well as tiny cupcakes just topped with and extra raspberry. 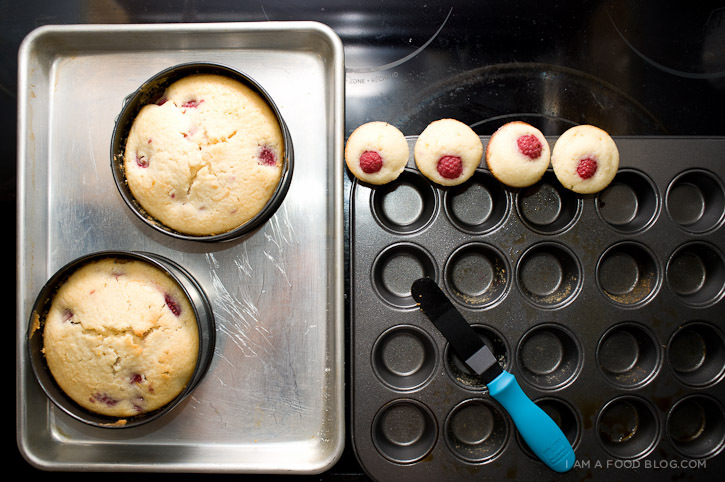 Spray a mini muffing pan with non-stick spray and top with a raspberry before baking for 12-15 minutes or until a toothpick comes out clean. 4″ pans? I’ve never seen those. 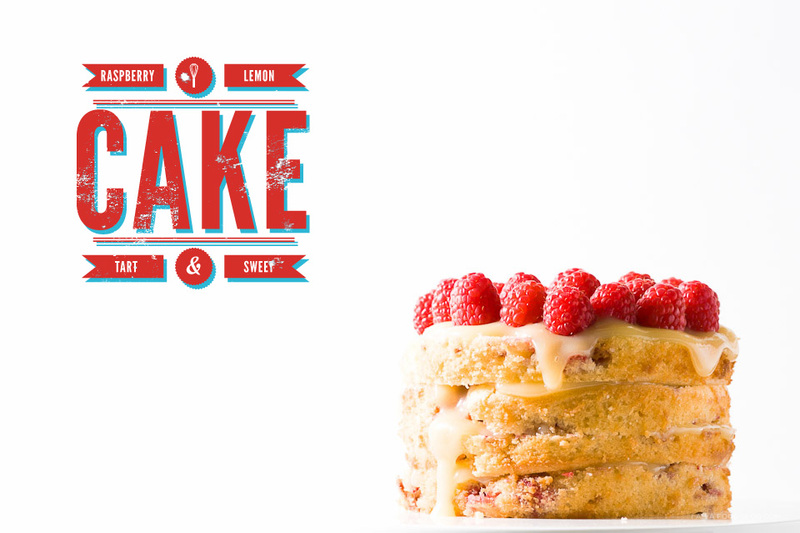 This cake combines the things I like the best: lemon curd and strawberries. I will try it when i find the pans.I love your recipes. They are delicious and you photos are always well done. Great recipes! The pans used are normally called mini spring sided pans, or mini cheesecake pans. Oh my gosh, this cake is so pretty! It looks really delicious – I love lemon and raspberries together! I’m so glad I stumbled upon this post! I love baking smaller cakes for people, as I find that no one likes a giant honking cake. I usually resort to using up the rest of the batter in cupcakes, but this is a much better alternative (and much less wasteful if I can’t find someone to pawn them off on!). Ooh, tiny cupcakes, you say? Must try! Definitely the next dessert I will cook! Looks delicious! Lemon and rasberries together must be really good! I am thinking of pouring Organic Maple Syrup on top of it (ok, I am from Quebec, Canada…that must be why I have to do that!!) Seriously, a little maple syrup (I take mine online with Rouge Maple) will make it the best dessert! thanks for sharing and inspiring! Love the pictures by the way! Mmmm…I love anything with lemon curd, and this looks gorgeous. No frosting means it’s good for you, right? My parents are both diabetic so making sweets isn’t really something I have the luxury of cooking often since I don’t want to be tempting them to eat more sugar than they should lol however, I’m looking forward to giving the lemon curd recipe a try when I have some time because I love lemon curd! Gorgeous! I love your style of photography! Ok, this cake does look AMAZING, and I would most likely be having 2 slices, not 1, however, you have friends that do not like chocolate or sweets?? I would actually banish them from my friendship list. It’s just nor right… Seriously. I’m dairy free. Is there a way to make a vegan cake like this? It looks delicious!!! Do you have to use whole milk? The ingredients just says “1/4 cup milk” but when reading the directions its says “stir whole milk, sour cream…”. Just curious if anyone has made this and what type of milk they used. This cake looks mouthwatering.. love the way that it’s a little bit lopsided. now I’m in the mood to go bake something layered! I cannot find 4 inch pans anywhere! What changes do i need to make using 9 in pans? I’m guessing this could be adapted to a standard size cake. Any suggestions? Lemon is my universe! Lemon cake…amazing recipe! This is a must-have. I may freeze some Meyer lemon juice now to make this in the summer when our raspberries are ready. i just found your website. i love it. i couldn’t be happier by the combination of lemons and raspberries…i LOVE it. thanks! This looks SO scrumptious! I never thought of using raspberries like this, and lemons are always delicious… great idea!! Love this lemon cake! Want to eat it right now..Wonderful recipe!!! 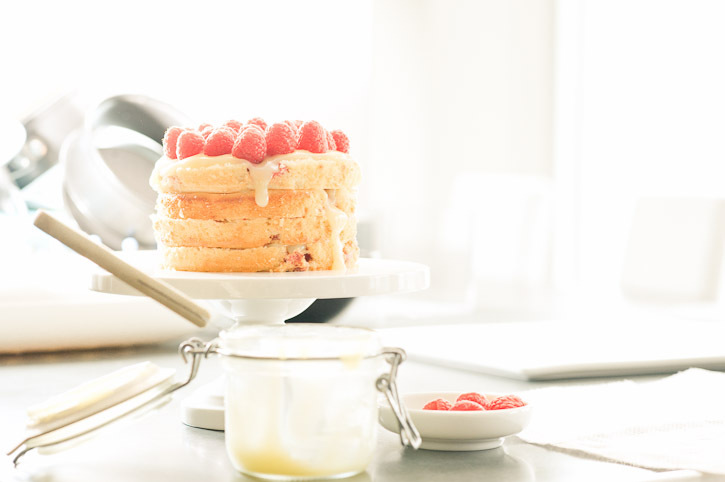 wow…lovely raspberry cake! Wanna eat it! So very delicious! Moist, with just enough lemony tang. Easy too! Mine wasn’t quite as cute as pictured here, but I believe that to be my own fault! It was a perfect cake for my family of 4, who love our sweets on special occasions, but also appreciate not being tempted to have cake 3 meals a day for the rest of the week! Note: make sure to bake it thoroughly. I took mine out just until the toothpick came out clean and it was so moist thatch was afraid it would fall apart! Do you mind sharing what equipment you use for your photos? Mainly lighting? Strobes or continuous? For lighting I use one strobe, usually bounced. Hope that helps! How would you convert it to standard cake tin size (8″ or 9″)? This is the recipe i’ve been looking for! The original recipe (http://sweetapolita.com/2011/02/triple-lemon-blueberry-layer-cake/) is for a three layer 8 inch cake. Hope you like it! This looks fabulous! I went the original recipe, & will do like yours &, double the lemon curd (Yum ! ), can’t have enough of that :-)! I’m going to make it sugar free with ” Ideal”.. Does great for baking (hubby is Diabetic). And, he Loves raspberries! Wish me luck! Wow, great, just great! Bookmarked right now! I just made this recipe, and loved it! 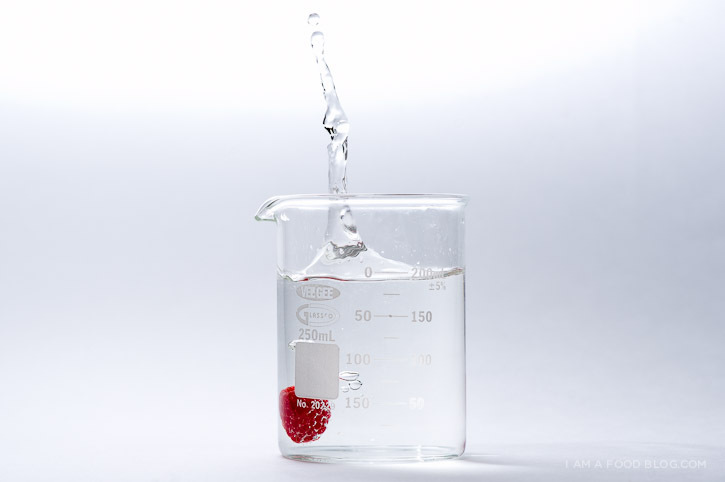 The delicate raspberry flavor was not overwhelmed by the lemon at all, but rather combined to form a wonderful combination of citrusy, sweet, and berry. It is a perfect end-of-summer recipe!